A goal in each half helped Musselburgh Windsor Under-14s beat Spartans Youth and advance to the final of the Kenny McLean Cup. Heavy rain over the weekend forced many youth matches to be postponed but it certainly didn’t put a dampener on either team’s performance in this one. Musselburgh started quickly and grabbed their first goal in the fourth minute of play. Steven Burns played through Cameron Mason, who found the bottom-left corner. 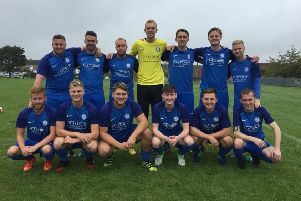 Spartans came very close to levelling soon after as Ruaidhri Manning played in William Lancaster, who rattled the left post with a ferocious shot. Shaun Brady nearly doubled Windsor’s advantage with a good header back across goal from a free-kick but his effort drifted narrowly wide of the post. Spartans thought they had equalised before half-time but their effort was ruled offside and Windsor took a 1-0 lead into the break. Alistair Millar and Sam Dickson came close to adding another for Windsor but Ewan Campbell scored in the second half, cementing Musselburgh’s lead, taking the ball around the keeper and slotting home. Spartans continued to test Cameron Bell in the opposition goal but could not find a way past him and Windsor claimed a deserved 2-0 win to make the final. Salvesen Under-13s are into the semi-finals of the Peter O’Neill Cup after a 2-1 win against Inverkeithing United. Salvesen took an early lead through Lewis Moffat, who profited from a mistake by the opposition keeper. Miko Brown produced a man-of-the-match performance in the middle of the park and Ben Blackley continued an impressive run of form out on the wing. 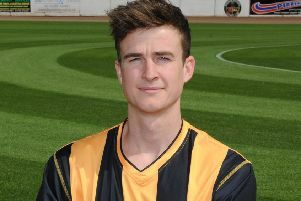 Struan Littlejohn commanded the back-line and was solid in defence. Inverkeithing pulled level but Lewis Marshall found the winner for Salveson from the edge of the box. Haddington Athletic Under-13s came from behind to defeat Craigroyston and progress to the final of the George Salmon Cup. The opening stages were very cagey as both teams tried to get control of the ball in blustery conditions. Craigroyston had opened the scoring in the first half. After the break, both teams continued to play some excellent free-flowing football and great defending from Cameron Mackinnon and the rest of the Haddington defence kept the score at 1-0. Haddington put pressure on the Craigroyston goal and had a few chances to equalise. And, with ten minutes to go, the Craigroyston keeper handled the ball outside of the box and the referee gave a free-kick. Drew Doherty laid the ball off to Brandon McDonald, who rifled the ball into the top corner. Five minutes later, McDonald controlled the ball just inside the box and slotted into the bottom corner. Craigroyston pushed for the equaliser but Haddington dug in and were able to see out the game 2-1. Dunbar United Colts Under-15s overcame Newcraighall Leith Vics 5-1 in a Division 2 League Cup semi-final. Findlay Thomson gave Dunbar the lead in the 25th minute. Just before half-time, Mikey Wimbledon-Hall doubled their advantage. Within a minute of the restart, Dunbar were 3-0 up as substitute Scott Ramsay made an instant impact by lobbing the goalkeeper. Wimbledon-Hall made it 4-0 on the 50-minute mark before Newcraighall pulled one back. Wimbledon-Hall scored again to seal his hat-trick and his team’s spot in the final.